Around 80% of deaths that happen during sailing occur from drowning. This is why a life jacket is the most important safety item during sailing. In many countries, personal floatation devices are required on board of all sailing boats at all times. The size of a life jacket depends on the weight and the chest size of the person that will be wearing the jacket. Both the weight and the chest size are usually clearly marked on the inside label of every jacket. You want to wear a life jacket at all times when sailing on a dinghy because of capsizing risks. If you are sailing on a keelboat, you should wear a life jacket when you feel that the conditions are getting bad. Every person on a boat needs to know where their life jackets are. You need to replace a life jacket if it becomes damaged. 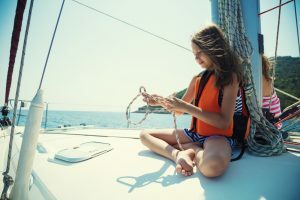 All people that need extra assistance while sailing, including children and those who can’t swim, should wear life jackets on all sailing boats at all times. You need to make sure that children are wearing the jackets that fit properly.